Here on the TARL Blog we will provide updates about the various projects underway. Some have been ‘underway’ for years but there will be new projects as well: as researchers visit, as we take on a growing number of students, as we reach out to UT faculty in an effort to make the collections available to them for classroom education materials and teaching resources and as we continue to evolve along with the current best practice standards in collections management. Ever cognizant of our status as a research arm of the University of Texas at Austin, we will continue to promote the use of collections for academic and research purposes while providing enrichment for students and professional services to those entities, both public and private, seeking professional curatorial services. Dr. Deborah Bolnick (right) and Research Fellow Jennifer Raff (left) confer about sample selection for aDNA potential in the Human Osteology Collection. Photo by Anna Donlan of The Alcalde. Patterns of wear on replicated stone tools used for woodworking are shown at a magnification of 500X. The three tools–an adze and two flakes–were crafted by a modern knapper and used for different tasks on different types of wood. 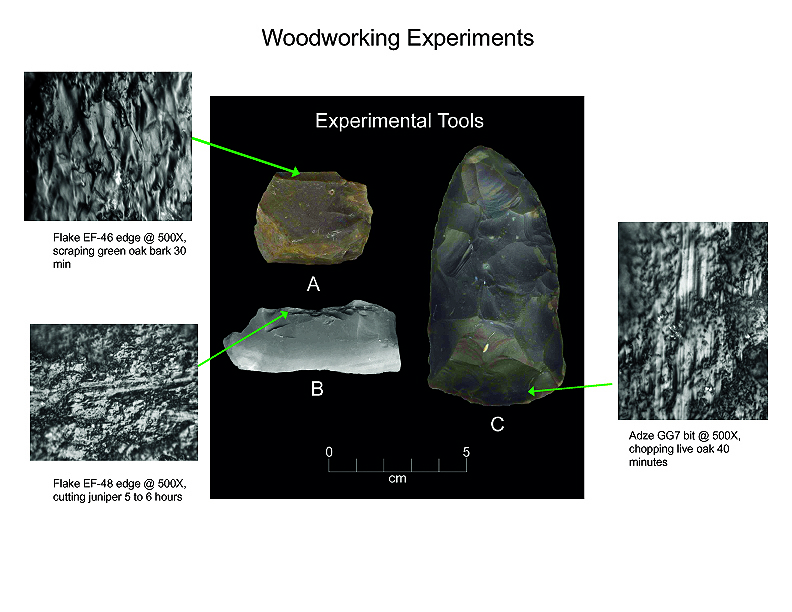 Experimental tools such as these provide a comparative baseline for discerning microwear patterns on ancient tools, determining how they might have been used, and on what materials. Snail shell usually preserves well anywhere in Texas except in sandy, acidic, calcium-deficient soils in east Texas (or clay-rich vertisols). Bone is about 30% organic material (collagen), and when bone decays, bacteria attack the organic component, opening up the matrix to further degradation by soil acids. Snail shell, on the other hand, has only about 1-5% organic matter or less, and is essentially immune to bacterial attack. I have seen a number of Texas archeological sites where the bone was completely decayed away, or reduced to corroded, unidentifiable fragments, but the snail shell was well preserved. A good example is furnished by the Paleoindian deposits at the Pavo Real site, where almost no bone whatsoever was recovered, but where snail shell was well preserved, and the assemblage was small only because the excavators made no effort at systematic collection. Most Texas archeologists have no interest in snails whatsoever. The standard research protocol for snails is to throw them away. I have seen many reports from snail-rich parts of Texas in which the word “snail” never appears anywhere, even in stratigraphic descriptions. In CRM studies, snails are one more type of analysis that must be paid for, and another collection category that must be curated. Better to pretend they don’t exist – that’s the prevailing paradigm. Although basic scientific terminology for mammals became solidified by the beginning of the 20th century, the situation for snails is very different. The taxonomy is constantly changing, and archeologists should be aware of that. In the war between lumpers and splitters, the splitters carried the day in the 1930s-1960s, and as a result, a great many species and subspecies were created that are now known to be invalid (perhaps this is why so many species have been reported for Texas). In the last couple of decades, biologists have started to apply DNA analysis to snails, and as a result, many taxa have been collapsed into simpler groupings, often with revised names. As a result, one needs to understand the taxonomic history to correlate new species names with the old ones, because many of the snails reported in the Texas archeomalacological literature are listed under old, outdated names. The example probably most familiar to archeologists is the revision in 1974 of the genus Bulimulus to the genus Rabdotus, but there are many other examples to be found, and every year the species names change. Snails are highly moisture-dependant, which makes them good paleo-moisture proxies in archeological sites. Unlike cursorial mammals, they can’t travel to a water source, and when they do travel, it’s on a mucus trail that results in major water loss. Everyone has probably seen the slime trails left by slugs on rainy nights. Slugs are snails that have lost their external shell through evolutionary processes. Active slugs can lose 30-40% of their body weight within two hours. Snails regulate water loss by adjusting behavior in both time and space. They are nocturnal, they gravitate towards areas with high relative humidity or moist substrates, and they are inactive during the day. In dry periods, snails can estivate, practicing metabolic arrest and tolerating remarkably high levels of toxins in their kidneys, withdrawing into the shell and sealing it with an epiphragm. Most snails are not particularly temperature-sensitive, but they are useful indicators of past moisture conditions and microhabitats. This can readily be seen on a macro scale by plotting their geographic ranges on isopleth maps of annual rainfall. The San Marcos samples (this one from Unit 3) produced thousands of adult Gastrocopta. There is no scale shown, but each shell is probably less than about 3 millimeters in length. These appear to all be the same species. Image courtesy of Ken Brown. When archeologists identify animal bones to try to diagnose past environments, they are essentially “sampling” an area that may have a radius anywhere from meters to kilometers in size. With buried pollen, the sampling radius may be as much as tens or hundreds of kilometers, depending on whether the plants were wind-pollinated or insect-pollinated. With snails, the sampling radius is immediate to the site area, unless they have been transported downstream long distances and deposited in alluvium. The smallest snail species have a home range that may only be a few tens of centimeters in radius, so snails can often provide information on past habitats that are much more localized in geographic scope. This can be an advantage if the project archeologist is more interested in the site paleoenvironment than the regional paleoenvironment. Sam Cason collecting sediment samples for snail recovery at the Genevieve Lykes Duncan site, on the 02 Ranch in Brewster County. This 2.8 meter high column in the arroyo wall runs from the modern ground surface to a level estimated at about 10,200 radiocarbon years before present. Excavations in the Paleoindian deposits are ongoing just out of view to the right, at about the same level where Sam is working. One of the completed sample bags can be seen at lower right (average weight, 15. 5 kilograms, or 34 pounds). Image courtesy of Ken Brown. 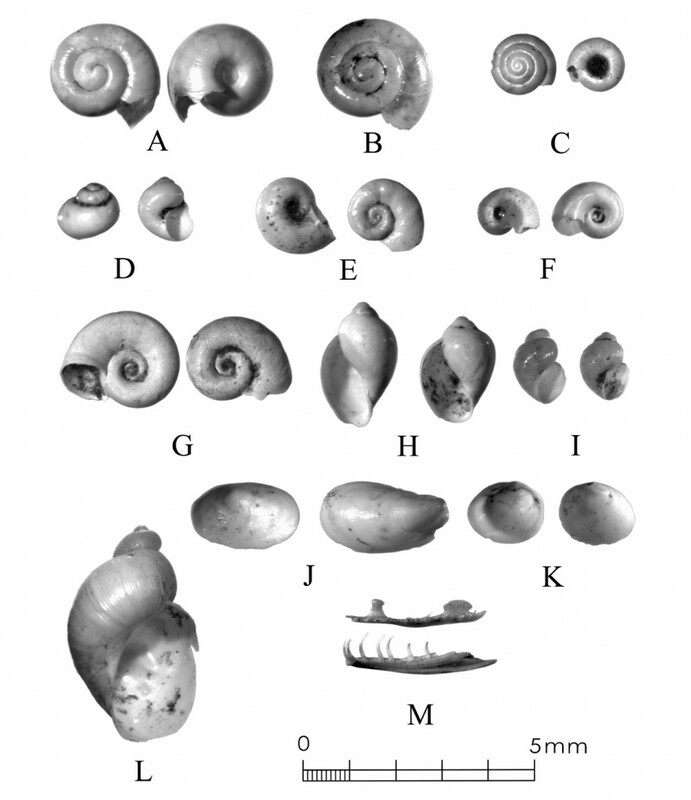 Sampling of snails for paleoenvironmental studies has much in common with the procedures used for charcoal and plant macrofossils, although there are some differences. Because archeologists are usually concerned with environmental change over time, columns of samples at 5-cm or 10-cm intervals are collected from standing profile walls (preferably one already recorded by the project geomorphologist). 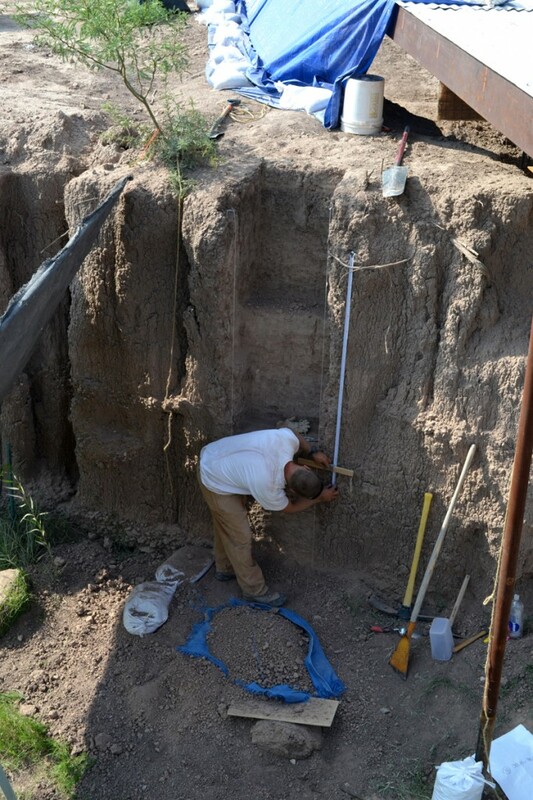 The sampling intervals are tied into the site grid, usually shot in with a total data station, and often the levels are the same as those used in the excavation units. While in theory we could just as easily sample horizontally on a given surface, it’s usually change over time we’re looking for. My target sample size is usually 15-20 liters of sediment. These are large samples, much larger than those used in pollen analysis. The goal is to obtain specimen counts large enough to allow quantitative treatment of data. Sediment samples are dried, weighed (in kilograms), measured volumetrically (in liters), then soaked overnight in water (with sodium carbonate if clay-rich). If snails float to the surface, they are scooped up with a strainer and dried separately (as “floaters”). The sediment is wet-sieved through nested 2 mm, 1 mm, and 0.5 mm brass geologic sieves, without pushing the sediment through the sieve. 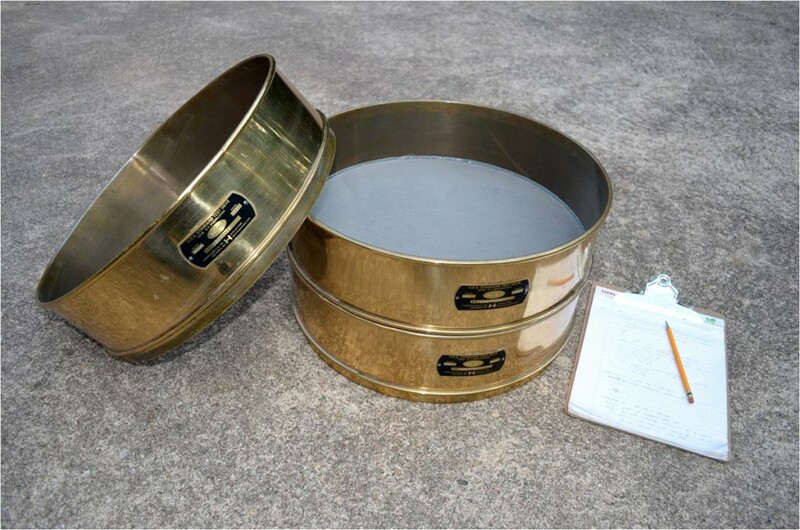 These are custom-made, extra-large sieves, 18 inches in diameter to allow processing of the oversize samples. Residue retained on the sieves is dried in the lab, then manually picked with forceps or a paintbrush. Microsnails are identified under low magnification (usually only about 10X, but up to 40X). I also save shell fragments and weigh them, because these can indicate changes over time in taphonomic conditions, and because some taxa can be identified even from fragments. Many archeologists seem to think that only complete shells can be identified and need to be saved, but this is not true. It depends on the species. The specimen counts and weights are then entered in spreadsheets. 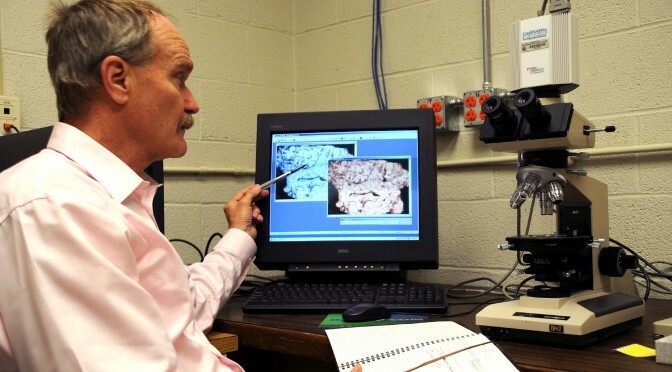 Photodocumentation is done, generally with a microscope-mounted videocam for small specimens. 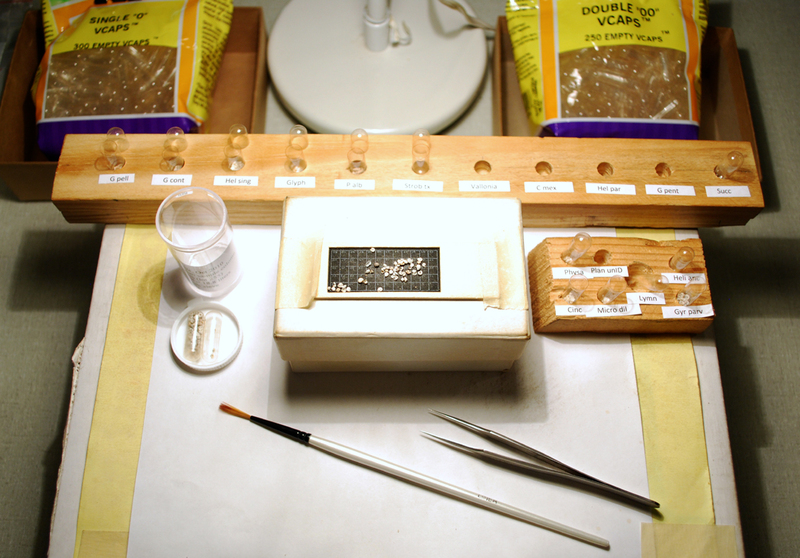 Microsnails are stored in gelcaps placed in plastic vials (not bags!). Samples are wet-sieved through nested oversize (18 inch) custom-made geological sieves. There are three mesh sizes: 2 mm, 1 mm, and 0.5 mm. I use oversize sieves because I work with large samples (generally 15-20 liters) in order to get specimen counts that are large enough for quantitative analysis. In Britain, where the climate is wet and snails are abundant, researchers can routinely work with only 1-2 kilograms of sediment. Image courtesy of Ken Brown. I also save any other kinds of material that may be of interest to other specialists working on a project. Vertebrate bone (including rodent teeth, fish bone, and snake vertebrae), fish scales, charcoal fragments, charred seeds, uncharred hackberry seeds, flakes of mussel shell, microdebitage from stone toolmaking, ostracod valves, and charophyte oogonia (the calcareous fruiting bodies from green algae) can emerge from the snail samples. At the Genevieve Lykes Duncan site, even the sediment residue itself was saved for heavy mineral separation studies. 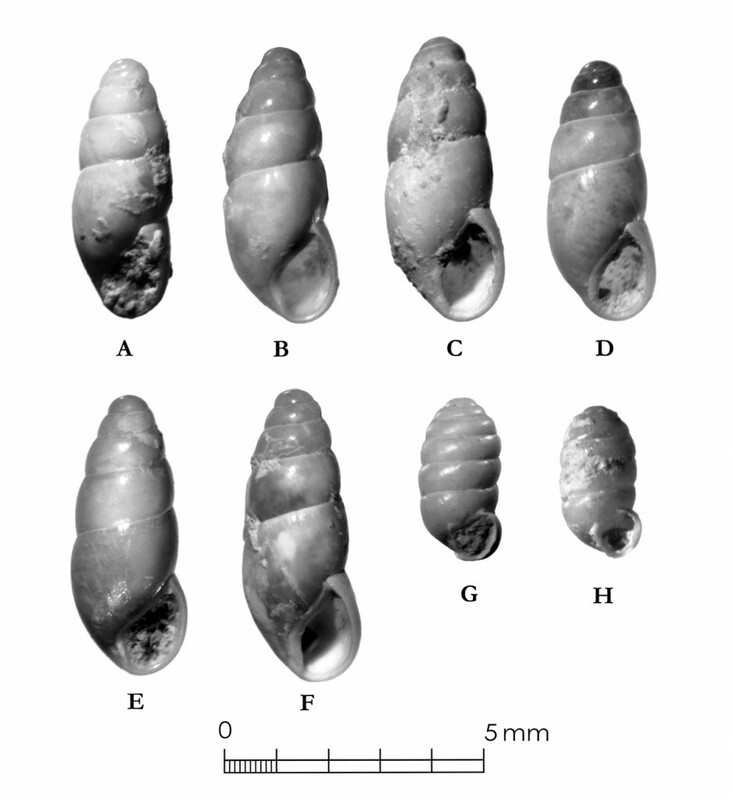 As a very rough estimate, perhaps 30% of the native Texas land species are large-bodied (adult shell diameter over about 10 mm), perhaps another 24% or so are medium bodied (about 5-10 mm diameter), and the remaining 46% are microsnails (these percentages are somewhat problematical). Aquatic snails also have a wide range of body sizes, although the size partitioning is unknown. All of these are potentially informative about past environments (especially the microsnails), so a sampling technique that recovers the full spectrum of body sizes is important. A reasonable guess would be that about 60% of the adult terrestrial species in Texas are too small to be retained on standard quarter-inch field screens. That means that in any particular site, not a single example of about 60% of the species that are actually present might show up unless fine sieving is done. The situation is even worse when we consider juveniles. All juvenile microsnails, perhaps half or more of the medium-bodied species, and even many of the large-bodied species will fall through standard quarter-inch mesh. Because column samples, even 20-liter ones, tend not to capture very many large-bodied snails, I like to combine that information with a sample of large and medium-bodied snails from field screens. I will usually ask the field crew to save all snails and shell fragments from one or two excavation units that are closest to the column sample, and if they complain, I can always bribe them with the promise of cold beer. This is science, but it’s about as low-tech as you can get. Preliminary sorting of microsnails can be done without magnification, but final identification requires a microscope, usually at about 10-30X. Specimens are manipulated with an artist’s paintbrush, or sometimes with a pair of Italian steel forceps. Image courtesy of Ken Brown. Analysis involves identifying each specimen to species, genus, or family if possible; tabulating adults and juveniles, complete and partial specimens separately; and measuring selected species (to the nearest tenth of a millimeter). While it’s not always possible to identify each specimen to the species level, it may not matter. Often, the members of a genus or even of a family share habitat preferences sufficiently that it’s adequate just to pin down the ID to the genus or family level. The real goal of identification is to see what habitat preferences are expressed in the assemblage at any one level, and how these might change over time, because the habitat preferences tell us what the environment was like. If there’s consensus among the different snail species, we know there was a uniform environment. If there are disparities, we know we either have a mosaic or patchy environment, or else transport mechanisms (like flooding) have introduced snails from contrasting habitats. When identification is finished, we can look for changes in faunal composition over time, plot stratigraphic changes in adult-juvenile ratios, use the metric data to look for secular changes in body size, and plot changes in species richness and specimen abundance, as well as ratios of complete and fragmentary specimens. Experience with Texas sediments has shown that depositional history is a major driver of changes in snail faunas. In alluvial deposits, it seems to be common for snail species richness and abundance to increase over time and with diminishing depth, because the deepest deposits show evidence of higher depositional rates. Likewise, the percentage of aquatic species may decline over time, not so much because the environment is becoming drier, but because the terrace tread is building up and as time goes on, it is less likely that flooding will deposit aquatic snails on the surface. Consequently, the aquatic/terrestrial ratio declines over time. Archeomalacology is both science and art. The art lies in recognizing these intrinsic geologic drivers of change and parsing out the less parochial changes that represent the regional environment, or site-specific microhabitats. Measurements of individual shell size can help with species identification, but more importantly, can allow us to build demographic profiles of a species that show whether human collecting has produced any kind of size bias in the sample of discarded shells. This profile of Rabdotus sp. 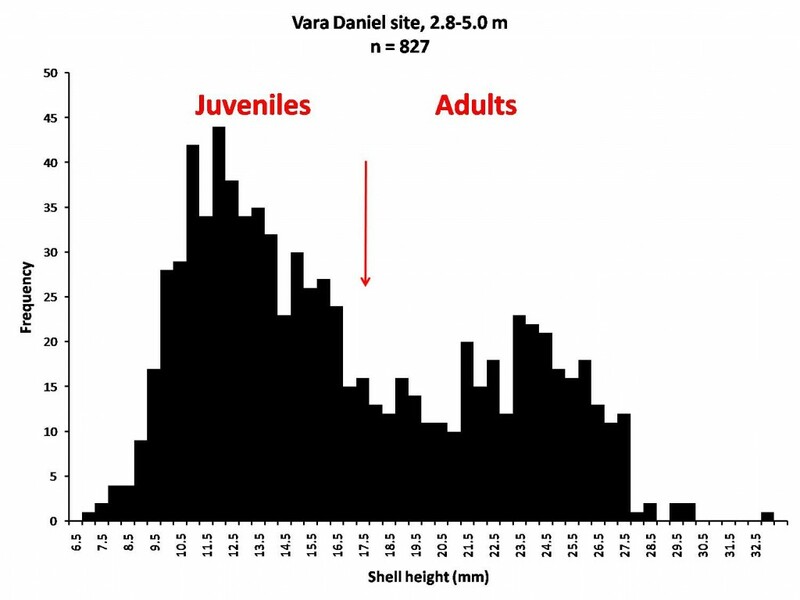 shell height comes from the entire sample column at the Vara Daniel site in Austin. It shows a bimodal distribution with significant juvenile mortality, and no marked preference for adults. This looks like a natural population profile, and it can be compared to size profiles from the contemporary San Marcos samples. Figure courtesy of Ken Brown. If sample columns are deep enough to penetrate Pleistocene sediments, they may document significant extirpation events or range changes at the end of the last ice age. 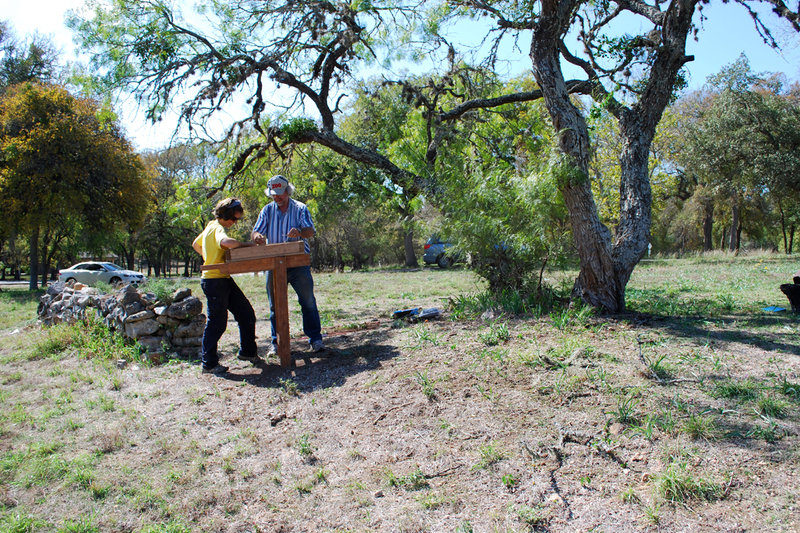 At the Vara Daniel site (Travis County), the terrestrials Cochlicopa lubricella, Pupilla muscorum, Vallonia sp., and Pomatiopsis lapidaria, and at Berger Bluff (Goliad County) the aquatic Valvata tricarinata appeared to be potential Pleistocene marker species. In the San Antonio area, Anguispira strongylodes appears at Pavo Real and at the San Antonio River Mammoth site, well beyond its current range. 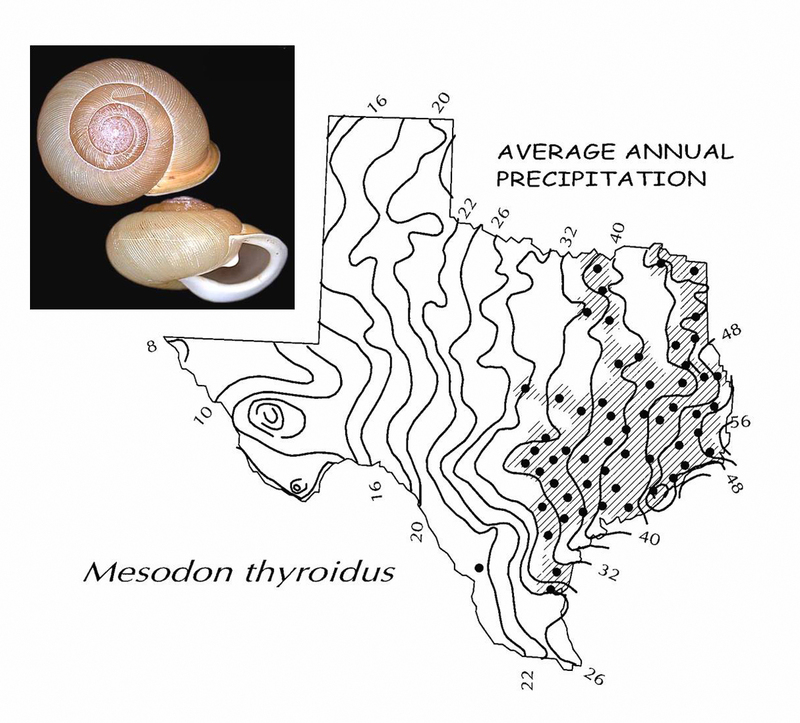 Since the end of the Pleistocene in Texas, the history of snail faunas has been one of reduced biodiversity, range retraction to the eastward (or to higher altitude in mountainous west Texas, or to the more extreme case of retraction: statewide extirpation), expansion of neotropical taxa, and in historic times, the invasion of Eurasian species. Among the aquatic snails, pulmonate species (lung-breathing snails capable of surviving in stagnant, poorly oxygenated waters) probably survived Holocene drying better than prosobranch (gill-breathing species which prefer clear-running, well-oxygenated water) snails. More than anything else, snails are sensitive to moisture levels in their immediate environment, since they can’t travel to water sources. The shaded area shows the species range for Mesodon thyroidus, a common large-bodied woodland species (the dots are individual county records). The isopleth map shows the species is restricted to areas with at least 32 inches of annual precipitation (the single outlier in the lower Rio Grande valley a restricted habitat of some sort). This plot uses geography to demonstrate moisture sensitivity, but we can also use this knowledge to trace changes over time instead of space. Figure courtesy of Ken Brown. In Texas, paleoenvironmental studies of snails have been done at early sites like Lubbock Lake, Lake Theo, Rex Rodgers, Wilson-Leonard, Vara Daniel, the Aubrey site, Richard Beene site, the bench deposits at Berger Bluff, La Paloma Mammoth site; and at later Holocene sites like the Anthon site, Fish Creek Slough, Guadalupe Bay, Kenyon Rockshelter, Smith Creek Bridge site, and the Hog Creek sites. These low-tech studies are difficult and labor-intensive, but they can be done most places in the state, especially where other paleoenvironmental proxies are scarce or lacking, and require little in the way of expensive equipment. The wide applicability of these studies would seem to warrant better attention from Texas archeologists in the future. Project archeologists contemplating such studies should contact the archeomalacologist well in advance and arrange for a site visit, preferably after good profiles have been developed, and as the project geomorphologist finishes fieldwork. Sample collection by the malacologist is preferable to samples collected by the field crew, except for selected field screen samples. Close consultation with the geomorphologist is essential. 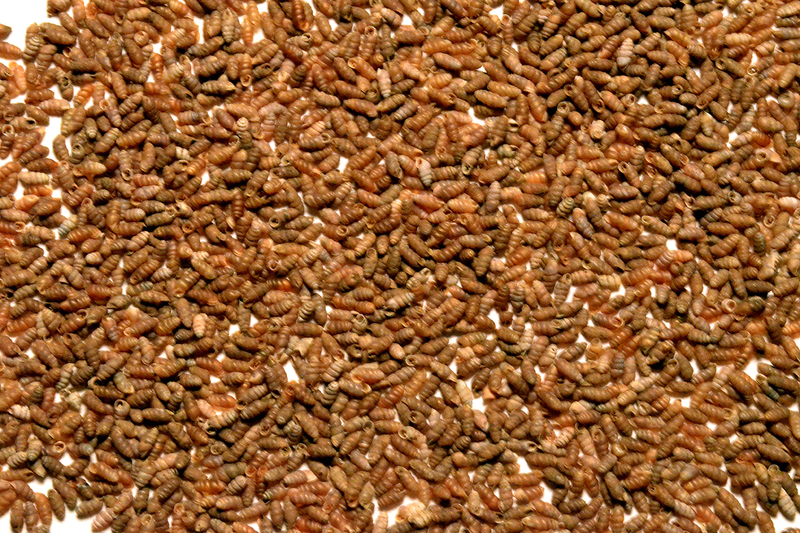 Terrestrial snails (Cochlicopa and Pupilla sp.) from the Vara Daniel site (mostly from deep auger tests). These are probably Pleistocene marker species and were perhaps extirpated in Central Texas before the Younger Dryas. They illustrate the effect of long-term climate change on snail faunas. Source: Archaeological Excavation of a Deeply Buried Paleoindian Component at the Vara Daniel Site (41 TV 1364), Travis County, Texas, Appendix K, Fig. K-11. EComm, 2010. Bloggists who want to know more about archeomalacology can look for Snails: Archaeology and Landscape Change (Paul Davies, 2008, Oxbow Books) or peruse online back issues of the ArchaeoMalacology Newsletter. Sampling for terrestrial and aquatic snails at a Late Prehistoric-Protohistoric site in Dallas County recovers a variety of biological material. A-C are terrestrial snails, D-I and L are aquatic snails, J is freshwater limpets, K are peaclams, and M is a pair of mandibles, possibly from embryonic or newly hatched snakes. Source: Archeological Data Recovery at Fish Creek Slough Site (41 DL 436), Fig. 6-6. AmaTerra, 2014. Slugs are snails that have lost their external shell through evolutionary processes. But they have a very small internal shell concealed in soft tissue. In native species of Texas slugs, this vestigial shell, called a slug plate, is a small oblong calcium carbonate object about 2-3 mm long. They look very much like chert pressure flakes and even have a thickening on one end that resembles a bulb of percussion. Because slugs have no external shell, they are highly susceptible to water loss. 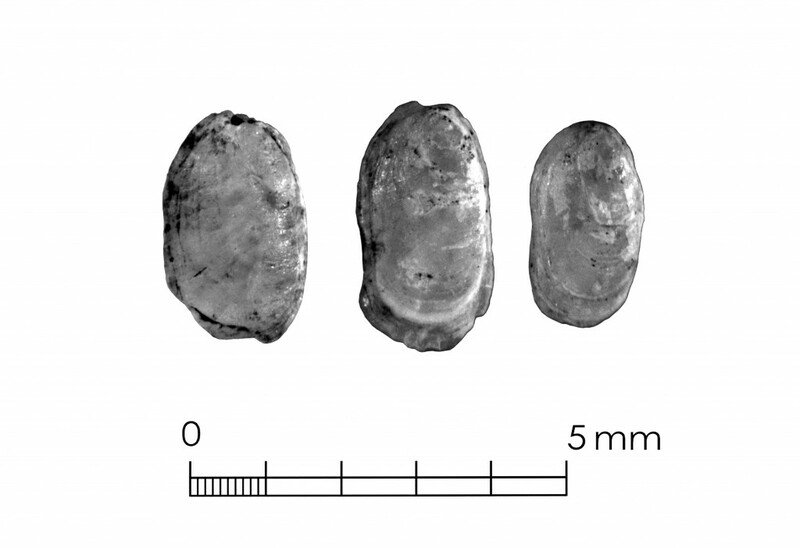 Recovered through fine screening, slug plates in archeological sites are good indicators of moist conditions in the past, but they can be mistaken for otoliths or pressure flakes by lab workers. Three slug plates recovered from Late Holocene deposits at the Fish Creek Slough site, Dallas County. Note the laminations and the slight thickening at the upper end of each. Image courtesy of Ken Brown.